The legendary Gold Miner Spiral Gold Panning Machine has been a prospector's favorite since 1994. This unit is loaded with features to make your panning experience not only fun, but potentially profitable because the Gold Miner will get the smallest speck of gold out of even the most stubborn black sands! Each GOLD MINER comes with: 12" spiral wheel, pump and spray bar assembly, catch cup for gold, drive unit with frame, tailings container, pump filter, carrying case with cover, and instructions. Just connect your 12 volt DC power source or battery (NOT INCLUDED) and you are ready to prospect! 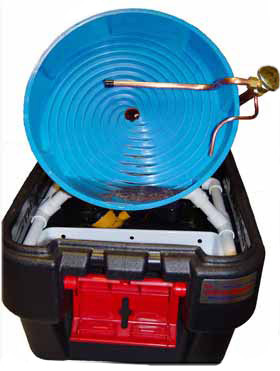 Take your Gold Miner spiral panning system anywhere! Weighs about 10 pounds-- including the self-contained carrying case. Dimensions of the carrying case are 20 inches long, 15 inches wide, and 13 inches high. The spiral pan is 12 inches in diameter. All components are designed for rugged outdoor use with no lubrication or maintenance. Runs on 12 volts DC. Built-in agitators vibrate concentrates to settle gold. Can decreases processing time by 25%. • "Micro adjuster" for fine tuning the pan angle, even while it's running, which is a real time saver! The micro-adjuster installs in less than a minute. It makes the pan angle a breeze and also secures the angle. Great for fine tuning the flour gold out of black sand. A simple add on, but rugged, won't strip out, and will last for years. • 7 spiral lead running at approximately 12 revolutions per minute, optimized for the highest recovery rate. Half inch recess at the beginning of each spiral rolls (agitates) your concentrates to settle the gold into the spirals quicker. Gold then spirals up to the center of the pan and drops into a catch cup on the back, cleanly separating the gold from the black sand. No need to hand "splash" the black sand out of a center disk like you must do on some of the more expensive machines. • 4 vent holes in case will help dissipate condensation caused by overlooked moisture when the Gold Miner is stored away. • Very simple to use; sets up in minutes and folds up and stores in carrying case.